Born in Baker, Louisiana circa 1952, Linda Thomas-Greenfield graduated from a segregated high school in 1970. The first in her family to graduate from high school, Thomas-Greenfield saw the local Peace Corps training center, which trained volunteers for work in Somalia and Swaziland, as influencing her decision to travel and work abroad. In 1974 Thomas-Greenfield graduated from Louisiana State University with a Bachelor’s Degree in Political Science. She then completed a Master’s Degree in Political Science at the University of Wisconsin the following year (1975) and taught political science at Bucknell University in Pennsylvania. Although she began a doctoral program, after a year-long political science fellowship in Liberia, Thomas-Greenfield completed the Foreign Service exam rather than her Ph.D. dissertation. She joined the U.S. Foreign Service and received her first overseas assignment in 1982 as a consular officer in the U.S. Embassy in Kingston, Jamaica. Thomas-Greenfield later held diplomatic positions at U.S. embassies in Lagos, Nigeria, Banjul, Gambia, and Nairobi, Kenya. She also served in the American embassies in Islamabad, Pakistan and Bern, Switzerland. In April 1994, Thomas-Greenfield was assigned to the U.S. Embassy in Kigali, Rwanda. Two days after her arrival in that nation, the Rwandan genocide began. Thomas-Greenfield was mistaken for a Tutsi and held at gunpoint until she could prove her American nationality. 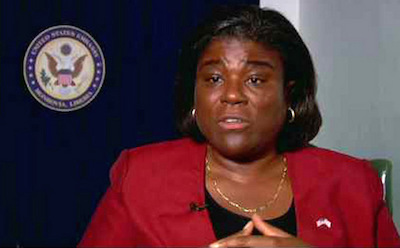 In between overseas assignments Thomas-Greenfield worked at the U.S. State Department in Washington, D.C. From 1991 to 1993 she was a staff assistant in the Office of the Director General of the Foreign Service. From 2004 to 2006 she worked in the Department’s Bureau of Human Resources, as a deputy assistant secretary in the Bureau of Population, Refugees, and Migration. In 2008, President George W. Bush nominated Thomas-Greenfield as U.S. Ambassador to Liberia. She represented U.S. interest there and encouraging the democratization of the nation after decades of civil wars. She served in Monrovia, Liberia until 2012. After returning from Liberia Thomas-Greenfield served from 2012 to 2013 as Director General of the Foreign Service and Director of Human Resources. Linda Thomas-Greenfield was sworn in as Assistant Secretary for the Bureau of Africa Affairs on August 6, 2013. In 2000, Linda Thomas-Greenfield received the Warren Christopher Award for Outstanding Achievement in Global Affairs. She has also received Superior, Meritorious, and Performance Awards, including the Presidential Meritorious Service Award in 2007 and 2008. Ambassador Thomas-Greenfield was a 2010 inductee into the Louisiana State University Alumni Association Hall of Distinction and an Honorary Degree of Doctor of Humane Letters Honoris Causa from Cuttington University in 2011. After traveling the world, Thomas-Greenfield returned to Baker, Louisiana in May 2014, to give the commencement address at the formerly all-white high school she had not been allowed to attend. Linda Thomas-Greenfield is married and has two children.